Polling on both the seats was held on December 20. New Delhi: The results of bypolls to Jasdan and Kolebira Assembly seats in Gujarat and Jharkhand will be declared on Sunday. Counting of votes is expected to begin at 8 am. Polling on both the seats was held on December 20. The outcome of Jasdan assembly bypoll in Gujarat is being keenly watched by the Congress and the ruling BJP against the backdrop of the saffron party’s debacle in three core Hindi states in recent assembly elections. The byelection has become a battle of prestige for the ruling party ahead of the 2019 Lok Sabha polls. The bypoll is mainly a bipolar contest between Kunvarji Bavaliya, a state Cabinet minister of the BJP and influential leader of the Koli community from the area, and Avsar Nakiya of the Congress. Nakiya, a Rajkot district panchayat member who had once worked closely with Bavaliya, a five-time MLA, contested the assembly election for the first time in his life. The election was necessitated after Bavaliya crossed over to the saffron party and resigned as MLA in July. As per rules, a minister has to get himself/herself elected to the Assembly within six months of taking the oath. 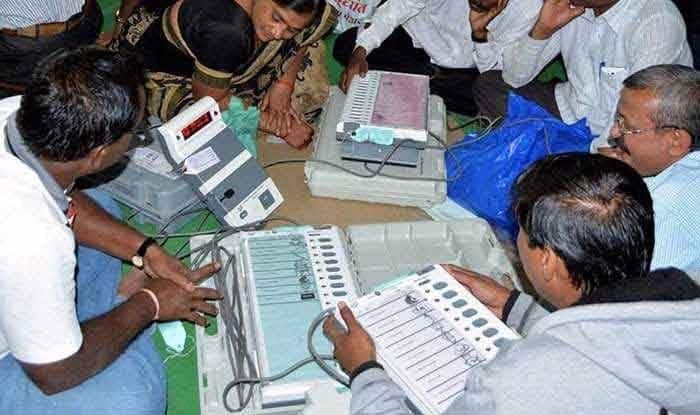 “Polling for Jasdan assembly seat in Rajkot district was held on December 20 with a voter turnout of 71.27 per cent”, stated a release issued by Gujarat Chief Electoral Officer S. Murali Krishna. The constituency has 2.32 lakh registered voters. Bavaliya had won the seat on Congress ticket in 1995, 1998, 2002, 2007 and 2017. Since the formation of Gujarat in 1960, the BJP has won this seat only once – in the by-election held in 2009 when Bavaliya vacated the seat after being elected to Lok Sabha from Rajkot. Meanwhile, the Kolebira seat fell vacant after Enos Ekka was convicted in the murder case of a teacher and awarded life sentence. In Kolebira, there are 2,79,332 voters. There are 270 polling booths, of which 70 are sensitive. The main contest is between the Congress, BJP and Jharkhand Party. The BJP has fielded Basant Soreng, while the Congress candidate is Viksal Kongadi. The Jharkhand Party has put up Menon Ekka. The Congress is supported by all the opposition parties except the Jharkhand Mukti Morcha (JMM). It is assumed that the result will set the tone for the battle for upcoming Lok Sabha elections due a few months from now. The saffron party recently ceded power to Congress in Hindi heartland states of Madhya Pradesh, Chhattisgarh, and Rajasthan.